The ARS Garin Chapter was established as the San Francisco Chapter on August 13, 1933, during a picnic, through the efforts of Mr. H. Amadouni, who was the editor of the Asbarez Newspaper at the time. Twenty-four Ungerouhis were initiated into the ranks of the new chapter by the national hero, Karekin Njdeh. Soon after, a six member executive body was elected. During the post-war period 1945 to 1946, with encouragement from Ung. 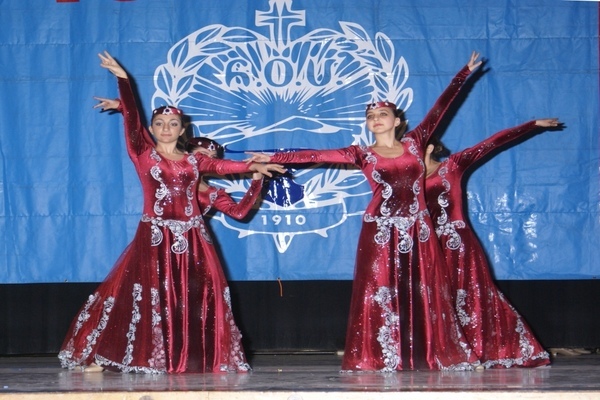 Hratch Tarpinian, the Garin Chapter established an Armenian Saturday School under the direction of Ung. Hamaspure Boghigian, with nine students. This was an important step towards the development of the Saturday School, which until 1978 ultimately led to more than 140 students. As a result of the Saturday School beginnings, the daily Krouzian-Zakarian Elementery and Vasbouragan Middle Armenian schools were established. The Garin Chapter continued the Saturday School until the year 1994. The chapter also established an Armenian Adult School, to provide the opportunity for Armenian-Americans to study beginning and intermediate Armenian. The chapter created an ARS Junior chapter called “Aidzemig”, for ages 13 to 18, and taught parliamentary procedures and bylaws, as preparation for future ARS members. Three of the “Aidzemig” members became Saturday School teachers, and volunteered for four years. The formation of the United Nations took place in the Opera House in San Francisco in 1945. The Garin Chapter was asked to be in charge of the food for the delegates. One day in the week was Armenian Day, and the ARS members prepared and served Armenian dishes. The entire delegation wasthankful, and delighted with the presentation for this very special occasion. Following the 1988 earthquake in Armenia, the Garin Chapter was responsible for collecting over $1 Million in monetary donations, in addition to securing large quantities of blankets, clothing, medications, and medical supplies and equipment. At the time, the chapter also participated in the Sister Chapter Program, by paired up to the ARS Chapter in Dilijan, Armenia. The San Francisco Social Services Office was established to assist Armenian refugees who escaped from Baku and other Azerbeijani towns. The office assisted in finding housing, jobs, and provided translation services and moving expenses to the refugees, in addition to assisting in assisting in enrolling children in schools and providing school uniforms to the students. The chapter sponsored a classroom at the Krouzian-Zakarian-Vasbouragan Armenian School (KZV) in San Francisco in 1990, and continues to award scholarships to KZV students, high school graduates, and university students. One of the accomplishments of the chapter was the creation of very authentically duplicated Armenian historical costumes, which were created for a fashion show, depicting the 10 major historical Armenia towns. After displaying the costumes at many libraries and during cultural events, they were passed on to the Hamazkayin Cultural and Educational Association for their presentations. For over a decade, the chapter held monthly luncheons for retirees, to allow them an opportunity to have lunch, entertainment, educational health and safety lectures, in addition to occasional field trips with other retirees living in the Bay area. The Garin Chapter continues its service in the Bay area, and occasionally plans joint programs with the Erepouni and Agnouni Chapters, also in the Bay area.